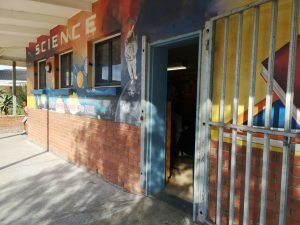 We arrive at the allocated school just in time to hear the first bell ring, the start of a new school day and the young learners slowly gather themselves around their respective classrooms. While some eager to get to class, others are running around and playing with their friends, waiting for the teacher to summon them into the classroom. I walk into the school office, see teachers rushing off to start their day and I am curious as to whether these teachers ever rest because they always seem like they are in a hurry. I meet my colleague and nurse, Cornelia, in the staff room and we set up the equipment for the day. The main purpose of the process is to screen for ADHD (attention-deficit/hyperactivity disorder), other mental health problems, and other learning difficulties – which can be a barrier to optimal learning for children – and to ensure they receive the necessary support. For us to be able to begin screening a learner, we require parental consent and completed information forms from both the parents and the teachers. In addition, we also require the learner’s academic record, their birth certificate, as well as their hospital clinic card. All of this information is critical to evaluate the holistic functioning of the learner. Today, we note tha t we have outstanding documentation and request the assistance of the school based support teacher. 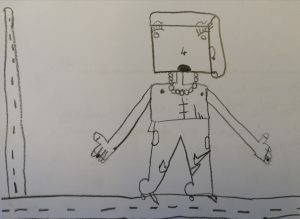 After providing the teacher with a list, she disappears in haste. Cornelia and I look at each other and smile – a silent understanding that it is going to be another eventful day at the “office”. We ask the school receptionist to call the learners to be screened over the intercom and while we wait we compile the required paperwork for each respective learner. We hear a faint knock at the door and in come four young learners. They line up in front of us with this bewildered look on their faces, unsure of why they have been summoned to the office. I smile at them and reassure them that we are there to help and we introduce ourselves. Cornelia, the nurse, jokingly tells them that they will not be getting injections from us today and they giggle nervously. We start the young learners off by doing a basic health check, Cornelia records their weights and height, takes their blood pressure and she notes any other health concerns. After they have done their health checks, we sit down with the young learners one by one and ask them to do a few basic and interactive tasks. By doing so, we can gain some basic insight into the ability of the learner to read, write, spell and how they cope in general with tasks. Our preliminary screening is crucial in helping our psychiatrist and psychologists to form a “picture” of the child and to determine which further assessments are needed and how best to assist the children. I call *Sibusiso to come sit next to me. He is 8 years old and comes across as a friendly and talkative boy, who is very eager to begin. I note that while he is doing a written task, he is experiencing difficulty holding this pencil and has difficulty spelling basic words. 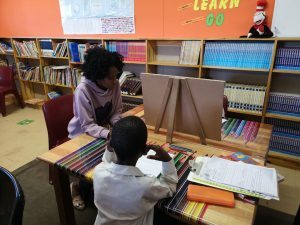 I take note that Sibusiso starts the tasks before he is told to begin, is tapping his feet on the floor and is very distracted by other children in the room. This alerts us to the possibility that he might be struggling with inattention, hyperactivity and impulsivity – the core features of ADHD. I focus on bringing Sibusiso’s attention back to the task at hand and tell him he is doing well. After I finish with Sibusiso, I offer him a star shaped sticker, he sits up straight and points to his forehead and smiles. I place the sticker on his forehead he proudly walks off. I can see that *Mary, who is 10 years old, is an extremely shy girl with a downcast gaze, I gently ask her to sit next to me. She is very soft spoken and I need to move closer to her to hear what she says. After pulling a silly face, I manage to get her to smile and softly giggle. She completes all the tasks very quietly and I take note that she struggles mostly with focusing her attention on the task at hand and her reading. I often find Mary staring vacantly in front of her during a task and she works slower than most children her age. This may be a sign that she is struggling with inattentiveness – another core symptom of ADHD. However, we need to make sure she is not anxious, or struggling with poor confidence. She bites her lips and smiles at me as I thank her for her hard work today. After seeing another two learners, the home time school bell rings and there is a hum of voices moving towards the school gate, our time is up for the day. Some days are more productive – if all goes well we screen up to 12 learners on a day! Cornelia and I make last minute notes and we send another message out to the school based support teacher requesting additional information. We gather our belongings and thank each other for another productive day. Although this is only the beginning, and I am the “newbie”on the team, I am grateful to be part of the process in changing the lives and futures of these young learners. 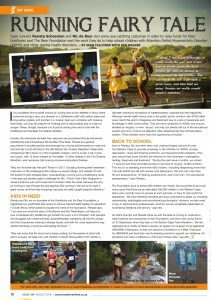 We are grateful to Modern Athlete (www.modernathlete.co.za) who has featured the Goldilocks and The Bear Foundation in their August 2018 Issue. Thank you Sean Falconer and Kim Walker, who have kindly granted us permission to reuse the article here. It is clearly best to leave the writing to the professional journalists! 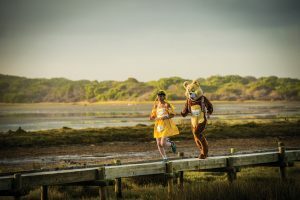 Cape runners Renata Schoeman and Nic de Beer don some eye-catching costumes in order to raise funds for their Goldilocks and The Bear Foundation and the work they do to help school children with Attention Deficit/Hyperactivity Disorder (ADHD) and other mental health disorder. 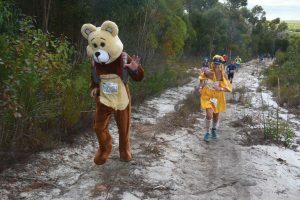 If you suddenly find yourself running or cycling next to two athletes in fancy dress costumes during a race, one dressed in a Goldilocks outfit with yellow dress and long yellow pigtails, and another in a ‘onesie’ bear suit, complete with massive bear-head, you may be forgiven for thinking you’re hallucinating due to a lack of oxygen. Relax, though, because you’ll just be sharing the road or trail with the Goldilocks and the Bear Foundation athletes. Usually, the characters beneath the costumes are psychiatrist Renata Schoeman (Goldilocks) and entrepreneur Nic de Beer (The Bear). 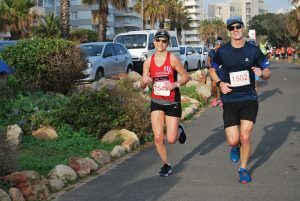 Renata is a general psychiatrist in private practice and amongst her running achievements on road and trail she has a 4:52:49 finish in the Old Mutual Two Oceans Marathon. Meanwhile, entrepreneur Nic’s focus is in the hospitality industry, and he is also a top runner and coach, with 12 silver medals at Comrades, 10 silver medals in the Two Oceans Marathon, and numerous trail running victories and podium finishes. 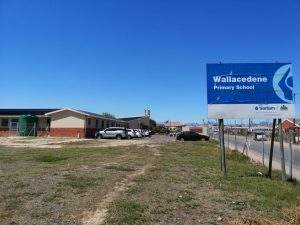 And so Renata, Nic and their team visit underprivileged schools all over the Western Cape to provide screening to the children for ADHD, anxiety, depression, visual and hearing problems, and developmental problems. They also ensure that these children are referred for the necessary investigation, testing, diagnosis and treatment. “During the past seven months, we visited 17 schools and have provided access to services to roughly 12,000 children. This led to us assisting more than 600 children, including diagnosing more than 150 with ADHD and 38 with anxiety and depression. We also did more than 95 eye assessments, 70 hearing assessments, and more than 110 educational assessments,” says Renata. 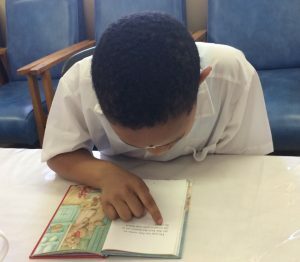 The Foundation aims to screen 500 children per month, but would like to do much more, given that there are an estimated 200,000 children in the Western Cape alone who currently have no access to such services, or have to wait month for assistance. “We have therefore recruited pro bono volunteers to assist us, including optometrists, audiologists and educational psychologists. However, we also need to buy in services from professionals, and thus we are completely dependent on fundraising initiatives and donors,” says Nic. So that’s how Nic and Renata came up with the idea of running in costume to raise funds for and awareness of their Foundation, and their next outing will be on 23 September when they take on the Sanlam Cape Town Marathon. “We are registered as a charity on Back-a-buddy, so people can support us as registered GB4ADHD Champions, or they can become a Goldilocks or a Bear Champion for GB4ADHD and host their own fundraising events to support our initiatives. All donations will make a difference in the lives of these kids,” says Nic. 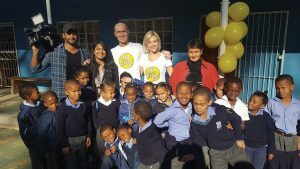 For more info, visit http://gb4adhd.co.za or www.facebook.com/gb4adhd, or make a donation at www.backabuddy.co.za/charity/profile/gb4adhd.